Places to see at Barkandia: Around 21 kms. of forest road is navigable but the stretch between Barkandia and Chaurasimal is ideal for spotting wildlife. There is a watch tower adjacent to the tourist accommodation which gives a panoramic view of the Hirakund Lake and the surrounding forests. 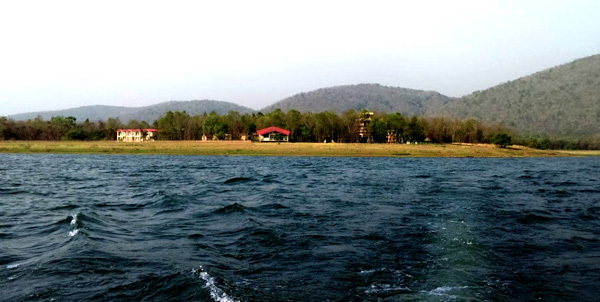 The cottages and rooms are located right on the bank of Hirakund Lake and is one of the best places to spot wildlife as the animals regularly visit the lake to quench their thirst. 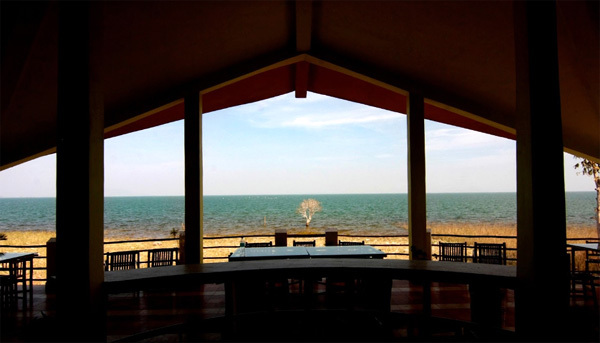 The dining area has a commanding view of the area and is the best place to laze away the afternoon gazing at the azure lake and occasional wildlife. There is also a Nature Interpretation Center and a butterfly park within the resort area. 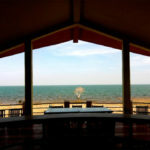 Nearby attractions from Barkandia: The best part of spotting wildlife at Barkandia is that you have to go inside the forest in your own vehicle. This gives you a chance to stop anywhere to watch the birds and animals at your own pace. 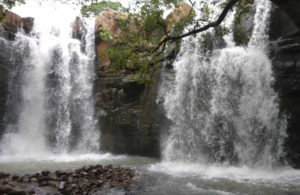 Apart from the forest and the lake, you can take a trip to some nearby waterfalls like Aapkol and Barabakra. If you have a couple of days in hand and wish to take a sightseeing tour, then visit the 25 kms. long Hirakund Dam built over Mahanadi River just 15 kms. away. It is the longest earthen dam in the world. The wildlife sanctuary is located on the right dyke of Hirakund Dam and you can drive along the dyke to reach Gandhi Minar and adjacent Nehru Park. From Gandhi Minar and Nehru Minar, you can get a panoramic view of the reservoir and Hirakund Dam. Other nearby attractions which you can cover in a day trip are Samaleswari Temple at Sambalpur, the Hydroelectric Project and Ghanteswari Temple and Chiplima and the leaning Shiva Temple at Huma on River Mahanadi. Things to do in Barkandia: Drive along the forest roads and spot a wide variety of wildlife including porcupines, Nilgais, Sambhars, Barking Deer, Indian Bisons (Gaurs), elephants, Wild Boars, hyenas, sloth bears, Wild Dogs (Dhols), Chousinghas, Indian leopards and more. If you are a bird watcher then you are in for a surprise. Apart from the resident birds like peacocks, Mainas, Flycatchers, owls, Bulbuls, hornbills and many more you can also spot migratory birds in the lake like Great Crested Grebes, Pintails and many more. In total, this wildlife sanctuary boasts of 41 species of reptiles, 234 species of birds, 40 species of mammals, 85 species of butterflies, 42 species of fishes and a wide spectrum of amphibians. Apart from wildlife tracking, boating in the Hirakund Lake, which is one of the largest man made lakes in the world, a visit to the Nature Interpretation Center and a short trek along the open-air butterfly park are few other things you can do here. Best time to visit Barkandia: You can visit Barkandia WLS anytime of the year except for the rainy season between June and September, when the sanctuary stays closed. How to reach Barkandia: Sambalpur is around 40 kms from Barkandia beat in Hirakund WLS. You can hire cars to Barkandia from Sambalpur. While Sambalpur is the nearest rail head, the nearest airport is in Bhubaneshwar around 279 kms. away. There are regular trains from Howrah to Sambalpur. Lodging and dining facilities at Barkandia: There are 06 luxury AC cottages and 07 luxury rooms in the resort. All the rooms face Hirakund Lake and are well furnished with all modern facilities like large comfy beds, air – conditioners, attached western bathrooms with geysers and view facing balconies. The accommodation nestles within a fenced park area tucked within the forest with a watch tower offering a panoramic view of the lake, forest, hills and the horizon. Food is Indian cuisine, which is served in the Dining Hall located at the brink of the lake.